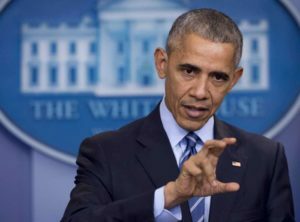 President Barack Obama has warned of retaliatory measures, including sanctions, against Russia for its alleged interference in the presidential election. Obama, however, “has provided little documentation to back up” his accusations against Moscow and is being pressed by both Republicans and Democrats to do so, The Hill reported on Dec. 29. Republicans on the House Intelligence Committee earlier this month demanded a briefing on the subject but they were rebuffed by intelligence leaders, who said they will not brief Congress again until the completion of the report for the White House. “Obama has asked the public to take the assessment of Russian interference largely on faith, suggesting that the American people already know everything they need to know to accept the conclusions of the CIA report,” the Hill report said. The White House also has not corroborated “subsequent leaks from anonymous officials contending that the CIA believes the campaign was an attempt by Russian President Vladimir Putin to ensure Donald Trump’s victory,” the report said. Meanwhile, Trump’s transition team has said the Obama administration should provide definitive proof of its claims. Obama has ordered the intelligence community to produce a complete review of its findings on the alleged Russian meddling before Trump is sworn in as the nation’s 45th president on Jan. 20. While the White House insists it will make as much of the report public as it can, some officials have warned that the report will contain “highly sensitive and classified information” and it is unclear how much concrete evidence will be released. Trump has rejected assertions that the Kremlin was involved in the hacks on the Democratic National Committee (DNC) and Hillary Clinton campaign chairman John Podesta. The Hill report noted that “private security firms have provided more detailed forensic analysis linking two well-known Russian intelligence groups to the data breach at the DNC.